42# Piggy On XLBGE, Pics as I go. While I applaud your culinary exploits with the whole hog I gotta say that cooked whole animals gross me out. Give me various cuts of meat and I will go to town...but when I see the skin and face a get a cold chill. But keep on doing your thing man. Her she is, so awesome, so happy, worth the effort, wait and stress. Definitely something I will do again. how big (weight) was that pig and what size egg are you using? Fantastic cook. Looks great - a job well done! 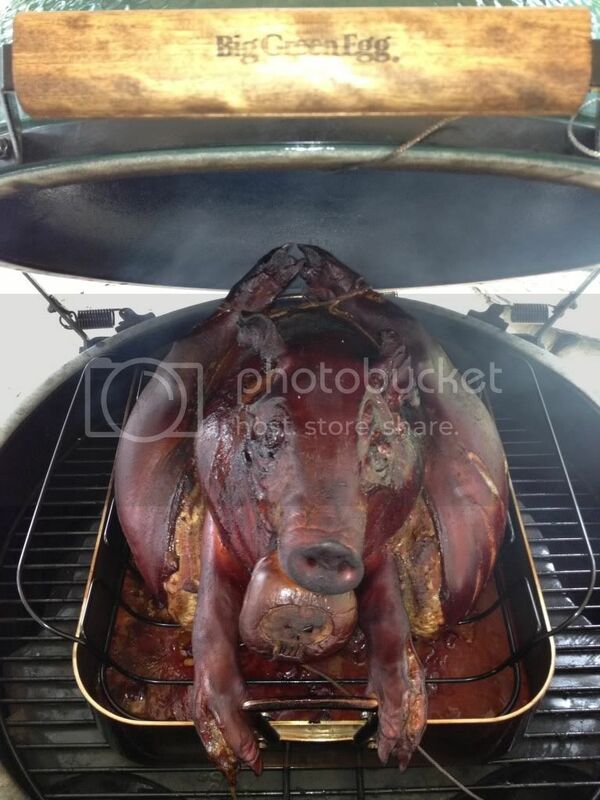 Looks good, That's kinda neat how you cut out the spine and got him all rolled onto himself.... On the last BBQ Pitmasters they talked about over and under cooking parts of the pig, did you have any trouble getting it all done without drying it out? I only let the ham get to 198f for fear that the loins might over cook. The entire cook came out moist and tender. And I think insulating the shoulders and ribs with the hams helped that. Bet that skin was fantastic! Thanks for the play-by-play. And I want an injector like that, just to hang in my kitchen. Fan-farkin-tastic!! That folded over pig looks fabulous. Bravo! All credit can go to BGE, Amazingribs.com, and this forum. Oh and Dan, who sold and set up my egg, Thanks! Looks great, congrats. How did you carve that baby? Did you chop and mix it all together or maybe take slices from different parts as you went? This was great to watch, thanks for sharing with us. That is a cool cook dude. But that thing looks too messed up for me and Im a Chef. @Black Badger first I pulled from different areas to let everyone taste the difference in texture of the different cuts, i.e. loin, ham, shoulder. By the end it all was pulled and mixed. That is very cool, sure looks and sounds like fun. Thanks. I'll tell you what, it was a lot of fun to be so involved in a process like it. On the side I held a BBQ sauce comp to make it fun for the members of the league. Only had 3 sauces show up and all three were awesome to pair with the pork. Did they let you have AP & Brees for the effort? =D> =D>looks great. Hats off to you! Bet the cheeks were awesome. Very nice cook! Although, I don't think I'll ever get permission to cook that. haha. Any post carving pics? 68% of statistics are made up on the spot. @Porta I wish I did, was so involved that only the bones were left when I had realized I hadn't taken any. But to recap I unrolled him on his back and served different cuts as requested but eventually it was all pulled and mixed. Suckling has to be one of the ultimate novelty cooks for any Egger. For starts I wouldn't know where to find one of these. I am going to get around to this cook one day. @Big_Ragu ;I called my local butcher and they ordered it up for me. All they asked was to give them a weeks notice. Was really fun to do. Learned a lot about the egg on this one. I think I will do it again.